A community is only as strong as its most vulnerable members. And while the elderly and ill are easily seen as such, those who care for them are often overlooked. Across the nation, more and more communities are realizing that local caregivers need more, better support. But when cultural differences and language disparities also play a role, as is the case in many of America’s Hispanic communities, finding effective solutions becomes even more complex. With a Hispanic population of almost 15 million in 2014 (making up 39 percent of the population), California is home to the largest Latino population in America. State leaders know that when accounting for different cultures, caregiving support is not a one-size-fits-all strategy: in order for their Hispanic caregivers to thrive, they need resources catered to their culture. In Santa Barbara County, there’s a group doing just that — and the results are galvanizing and inspirational. With such an ethnically diverse, economically varied, and rapidly aging population, Santa Barbara County’s needs are distinct — and so must be its approach to helping local caregivers. With approximately 70,000 unpaid caregivers accounting for $624 million each year, and with Hispanic and Latino immigrants accounting for almost half (45 percent) of the county’s overall population, effectively reaching the large and often-marginalized Hispanic caregiving community is seen as vital to a healthy community. Enter: the Promotores Network. This group of local Spanish-speaking volunteers is reaching caregivers in their Hispanic community in innovative, culturally relevant and previously unthinkable ways. The grassroots network advocates for healthy lifestyles through education, policy change, rich collaboration with other local organizations and, perhaps most importantly, through feet-on-the-ground, personal engagement. They share a palpable camaraderie, an intimate understanding of the Hispanic community’s unmet needs and a shared goal of providing lasting solutions. With a mission of “empowering families and individuals with respect, dignity and compassion by enhancing the quality of all aspects of their lives through education and promoting healthy behaviors,” the group has become a vital cog in the bigger machine of healthcare initiatives in Santa Barbara and further. What began in 2002 as a small volunteer group focusing on general health issues has since expanded to more than 300 trained members throughout the country, and that’s just the beginning. With growth in numbers has come a growth in services offered, including caregiving support, something much-needed in such a quickly aging environment. Promotores understand the Latino community they’re supporting because they’re part of it. Not only can they fill cultural and linguistic gaps, but they also understand that caregiving can be different in Spanish-speaking communities, who tend to have a more collectivist, informal mentality to helping family members. Rarely, for instance, do they send their elderly to homes to be cared for, leaving the majority of care to be done at home. The National Alliance for Caregiving and AARP found in 2015 that of all ethnicities, Hispanic caregivers have the highest reported prevalence of caregiving at 21 percent — and worse, they’re second only to African-Americans in experiencing higher burdens from caregiving (45 percent are considered “high burden caregivers”), as well as time spent caregiving (30 hours per week on average, compared to 20 hours on average for the white community). According to a 2016 study by the National Hispanic Council on Aging (NHCOA), informal caregivers in Hispanic communities often struggle to find information, programs or support to assist in their caregiving roles and reduce their caregiving burdens, contributing to stress and poor health. Simply put, Latino caregivers are in much need of support, recognition, and a reminder that they’re not alone — and Promotores are proving to be a long-awaited solution. One way Promotores provides this caregiving support is by spreading the knowledge of Atlas CareMaps. Whether through community health fairs, open public classes, state-wide conferences or peer-to-peer education, Promotores see the CareMap as both a key resource and a transformative solution for Hispanic caregivers. What’s so powerful about creating a CareMap? In short, it uses a simple pencil and paper to paint a completely new picture of a caregiver’s daily realities and networks, opening their eyes to their need for support. By asking important questions such as, “Who are you caring for? Who is caring for you? What support do you currently have? And how can you organize your caregiving network to be more efficient and supportive?” caregivers are able to better understand their personal care situations, discover why they feel so overwhelmed, and give themselves permission to ask for help. A growing number of Promotoras have been equipped to teach Hispanic caregivers how to create their own CareMaps. This summer, 30 Promotoras received training from Altas founder Rajiv Mehta to become CareMap facilitators, enabling them go into their communities and continue spreading the simple yet effective tool. 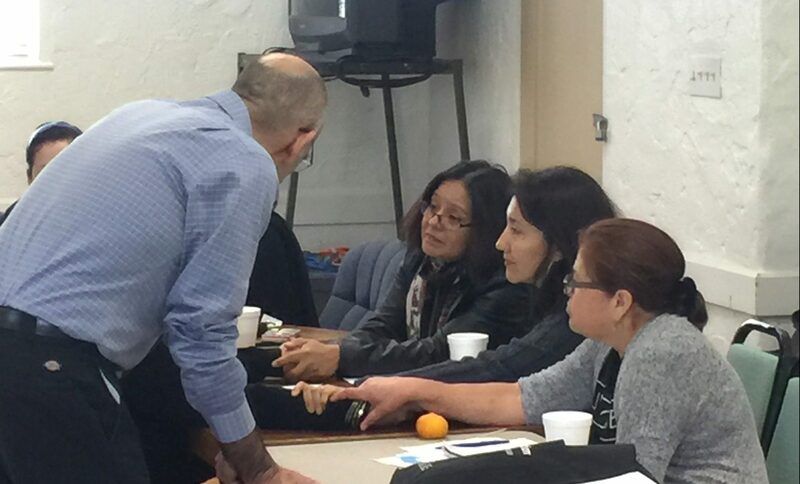 With such an immediate local impact, Promotores’ monthly CareMap workshops are now expanding to other cities in the county (Santa Maria and Lompoc), as well as more cities along the California coast. But the Promotores’ ultimate goal is to grow bigger than themselves. In order to help other organizations integrate Hispanic cultural customs into their own programs and services, Promotores’ rich collaborations will only continue. Whether it’s working with the Santa Barbara Foundation’s Community Caregiving Initiative to continue serving the local Latino community, working with state foundation Visión y Compromiso (VyC) to expand the program state-wide, or helping organizations in other states, such as Seattle-based Global to Local, Promotores plans to keep growing their impact for the greater Hispanic caregiving community. Atlas of Caregiving is proud to have such an inclusive and powerful partner, and we look forward to continue working with the Promotores Network to further spread knowledge of the CareMap tool to Hispanic and Latino caregivers nationwide.